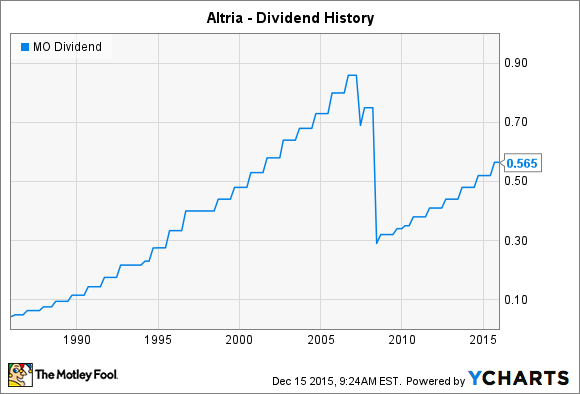 Altria isn't on the elite list of Dividend Aristocrats, but it should be. Here's why. Investors love great dividend stocks, and Altria Group (NYSE:MO) has one of the most impressive track records in the stock market. The tobacco company has not only managed to keep its share price moving higher but also has rewarded longtime shareholders with substantial and ever-increasing dividend payments along the way. Indeed, Altria has one of the longest track records of annual dividend increases in the stock market, as long as you're willing to take some special circumstances into account. Let's take a closer look at Altria to understand better how the tobacco giant put together such a strong performance and what lies ahead for dividend investors in the company. Throughout its history, Altria has made dividends a high priority. Ever since the mid-1990s, Altria has consistently set its dividends at a level at which it has paid more than half of its earnings back to shareholders. The business has been a cash cow, and Altria has overcome substantial challenges to return more capital to its investors, including the ongoing threat of catastrophic litigation liability and the push toward greater regulatory oversight and restrictions on marketing and product development. Altria's success is even more impressive when you consider some of the corporate upheavals it has gone through. In 2007, the company fully spun off its stake in Kraft Foods (UNKNOWN:KRFT.DL) to its shareholders, giving investors 70 shares of Kraft for every 100 Altria shares they owned. Then the following the year, Altria spun off its Philip Morris International (NYSE:PM) unit, giving shareholders new stock in the international tobacco giant on a one-for-one share basis. As you can see below, those spinoffs affected the amount of per-share dividends the surviving Altria entity paid, and that sent Altria off the prestigious Dividend Aristocrats list. Nevertheless, when you take the spinoffs into account, Altria has given investors nearly half a century of rising dividends. Altria is once again going through what could be a substantial transformation, with its stake in beer maker SABMiller having become the target of a massive takeover bid from industry giant Anheuser-Busch InBev (NYSE:BUD). Altria has given its approval for the $107 billion deal, which will offer the tobacco company the ability to take a sizable ownership position in Anheuser-Busch going forward. That in turn should preserve Altria's alternate source of income from the beer industry, which has been a key diversifier to offset concerns about the health of the tobacco business. Given the opportunities available in the global beer market, Altria hopes that a more powerful Anheuser-Busch InBev will keep delivering the profits that investors have come to take for granted as a key supplement to the earning power of cigarettes, smokeless tobacco, wine, and the most recent addition of tobacco alternatives like electronic cigarettes. When will Altria's dividends rise again? Altria last raised its dividend in September, and the company has routinely chosen the third quarter of the year to make increases to its payout. With the pricing power that Altria has demonstrated, investors can expect the tobacco giant to give its shareholders another dividend boost late next summer.